Wedged between top of the range paver driveways and functional cheaper asphalt driveways sits the concrete driveway, a driveway type that can be as plain or as fancy as you need it to be. Yes, concrete needn’t be boring, with decorative, stained, stamped and cut concrete driveways to choose from you will find this material more versatile than you may have first thought. 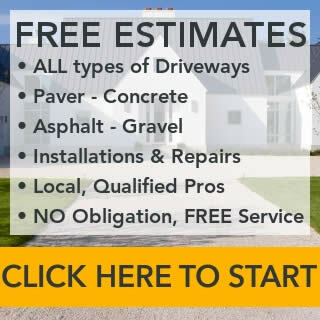 In this driveway guide we will guide you through all the options and ideas and layout the pros and cons, costs, installation cleaning and maintenance info you need to make a educated decision. Concrete has become the blank canvas of the driveway contractor who has creativity, skill and experience. A catalog of options for decorative concrete provides interesting alternatives to plain concrete. Knowing what’s available is the first step to selecting a concrete driveway style you’ll be pleased with for years to come. psi – pounds per square inch: The higher the percentage of cement in the concrete mix, the higher (stronger) the psi. Driveways are built with 3,000-6,000 psi concrete. Most driveways are four inches of 3,500-4,000 psi material. Unless very heavy equipment will be parked on your driveway, the standard thickness and strength is probably sufficient. Stamped Concrete: When the concrete is firm but still wet, metal templates are pressed or tamped into the material to form a pattern. A wide range of designs is used including staggered brick, herringbone brick, flagstone, cobblestone, European fan, granite, slate and wood plank. Colored Concrete: Concrete can be tinted in as many as 250 different hues. All the mix is colored; it’s not a surface application only, so it fades very little. Coloring is often used in conjunction with stamping and other finishing techniques to produce the desired look. 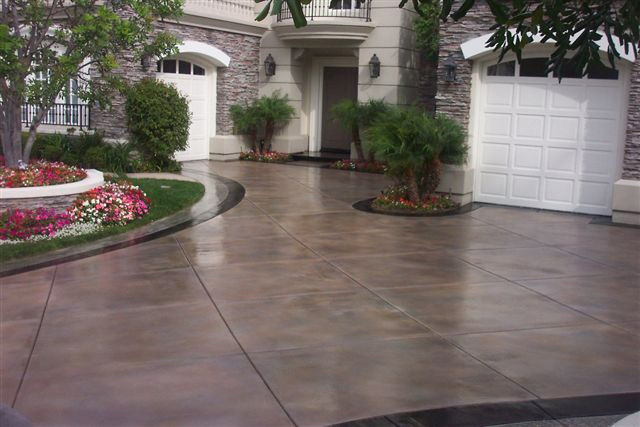 Stained Concrete: Chemical solutions containing metallic salts in an acidic base are applied to finished driveways. They react with hydrated lime in the cured concrete to give it the mottled look of granite, the varied appearance of slate and other elegant visuals. Staining, like coloring, can be combined with stamping. Cut Concrete: Hardened concrete can’t be stamped, of course, but it can be cut with a concrete saw or grooved with a hand tool to form a pattern. This is a labor-intensive and costly option. Staining works well with cutting and grooving concrete drives, but can be a stand-alone feature too. Here are the basic steps the concrete contractor will take to install your new, upgraded or replacement driveway. Sealing Concrete Driveways: Yes or No, and Why? Let’s tackle the “why” part first. Concrete is a porous material. Water penetrates bare concrete, though the water itself isn’t a problem. Concrete is used in piers, marine pillars and other wet environments. The issue is freezing. When moisture within the concrete freezes, it expands. The expansion cracks the concrete. This is the major reason that concrete driveways are more common in Southern climates and asphalt drives are prevalent in the North. The second reason to consider sealing your concrete driveway is that sealer resists the penetration of stains from engine fluids, fertilizer, leaf tannin and other common substances, and it is easier to clean when sealed. 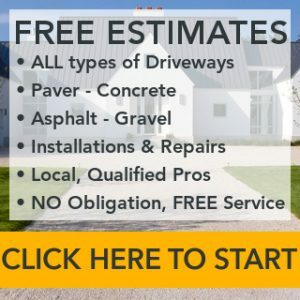 Should you seal your concrete driveway? If you live in a cold climate where freezes are possible or common, then sealing the driveway is essential. Without it, the surface will begin to deteriorate noticeably in one to three winters. If freezing isn’t common in your climate, then concrete sealing is optional but recommended in order to keep your costly driveway looking great. As you consider sealers, the most affordable are acrylic resin sealers and chemically reactive sealers that can be applied for less than $1.50/sf. Epoxy and urethane coatings are tougher and very resistant to staining. They start at about $2.00 with application. Your concrete driveway will need to be resealed every two to five years depending on your climate and the quality of the sealer used. If you want to maintain a clean driveway, the first step is to have it sealed for resistance to staining and dirt penetration. Pre-treat stains with a multipurpose cleaner or one formulated to remove oil and grease. Allow the cleaner to penetrate the stain for 10-20 minutes, and then scrub the area with a stiff natural or nylon brush. Power washing is the best method for concrete driveway cleaning. Fill the machine with the appropriate cleaner. Choose one that is biodegradable and doesn’t contain bleach, so you won’t harm grass or other vegetation or stain your home’s siding. Use low pressure to apply the detergent, and then let it sit for 10 minutes. Rinse the concrete with high pressure. Machines with a psi of 2,000 to 3,000 psi should be held 8 to 15 inches from the surface; those with 3,000+ psi should be held 15 to 24 inches from the concrete. Minor crack repair is typically done as part of the resealing process. We’ve listed sealing costs as $1.25-$2.50 per square foot based on the type of sealer used. Depending on the number and severity of cracks, repairing them will increase the sealing cost by 25 to 100 percent. Individual crack repair starts at about $2 per linear foot and goes up based on the severity of the crack and what is used to repair it. A concrete driveway contractor called out for small repairs will likely also have a minimum service fee of $50-$200. Sections of concrete that have sunk can be lifted, and support material placed beneath them. If a section of concrete is badly damaged, it will need to be cut out and replaced.